Why is using a table variable more than twice as fast as a #temp table in this specific case? I was looking at the article here Temporary Tables vs. Table Variables and Their Effect on SQL Server Performance and on SQL Server 2008 was able to reproduce similar results to those shown there for 2005. When executing the stored procedures (definitions below) with only 10 rows the table variable version out performs the temporary table version by more than two times. My question is: What is the reason for the better performance of the table variable version? confirms that in both cases the temporary objects are being cached after the first run as expected rather than created from scratch again for every invocation. 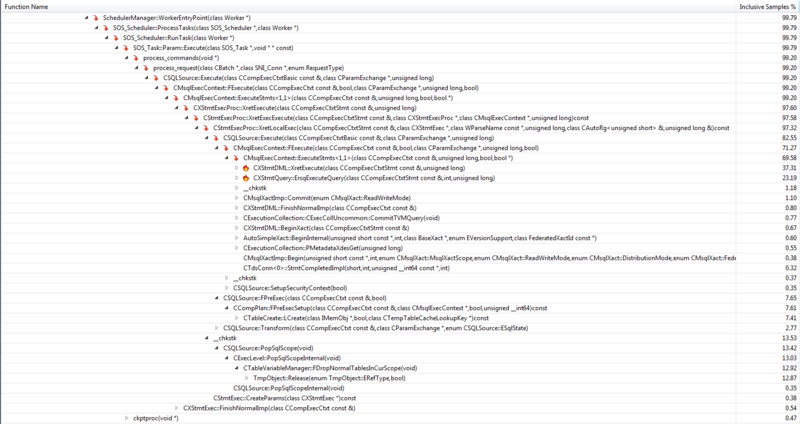 The slightly greater overhead of the first run of the stored procedure can in no way account for the big overall difference however as it still only takes a few ms to clear the procedure cache and run both procedures once so I don't believe either statistics or recompiles can be the cause. Both of these pages being latched belong to (different) non clustered indexes on the tempdb.sys.sysschobjs base table named 'nc1' and 'nc2'. Querying tempdb.sys.fn_dblog during the runs indicates that the number of log records added by the first execution of each stored procedure was somewhat variable but for subsequent executions the number added by each iteration was very consistent and predictable. 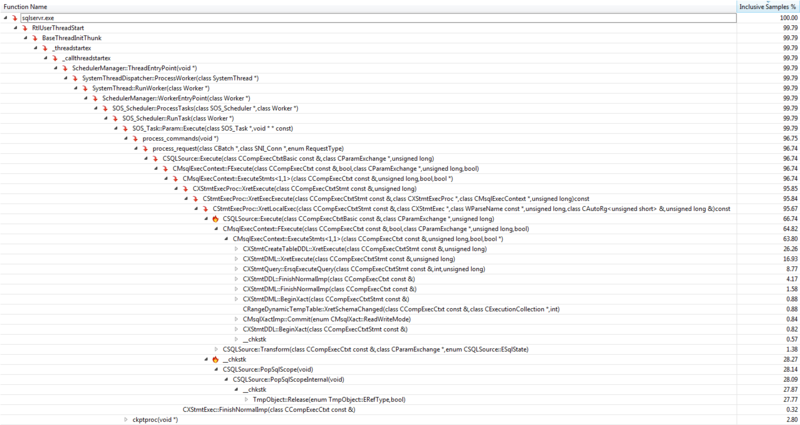 Once the procedure plans are cached the number of log entries are about half those needed for the #temp version. Looking at the transaction log entries in more detail for the #temp table version of the SP each subsequent invocation of the stored procedure creates three transactions and the table variable one only two. The INSERT/TVQUERY transactions are identical except for the name. This contains the log records for each of the 10 rows inserted to the temporary table or table variable plus the LOP_BEGIN_XACT/ LOP_COMMIT_XACT entries. The CREATE TABLE transaction only appears in the #Temp version and looks as follows. The FCheckAndCleanupCachedTempTable transaction appears in both but has 6 additional entries in the #temp version. These are the 6 rows referring to sys.sysschobjs and they have exactly the same pattern as above. Looking at these 6 rows in both transactions they correspond to the same operations. 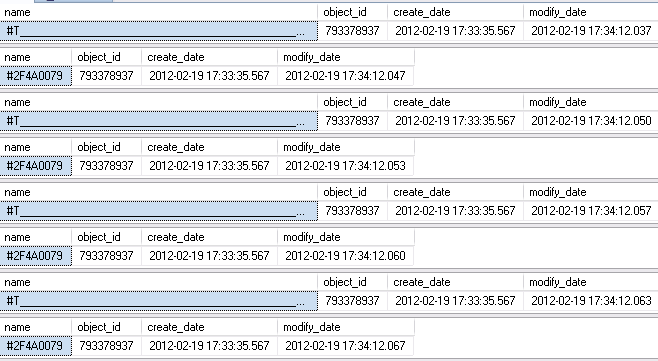 The first LOP_MODIFY_ROW, LCX_CLUSTERED is an update to the modify_date column in sys.objects. The remaining five rows are all concerned with object renaming. Because name is a key column of both affected NCIs (nc1 and nc2) this is carried out as a delete/insert for those then it goes back to the clustered index and updates that too. So one potential explanation for the observed performance differential as alluded to by Alex is that it is this additional work maintaining the system tables in tempdb that is responsible. The table variable version spends about 60% of the time performing the insert statement and the subsequent select whereas the temporary table is less than half that. This is inline with the timings shown in the OP and with the conclusion above that the difference in performance is down to time spent performing ancillary work not due to time spent in the query execution itself. Under both the create and release functions the function CMEDProxyObject::SetName is shown with an inclusive sample value of 19.6%. From which I infer that 39.2% of the time in the temporary table case is taken up with the renaming described earlier. Not the answer you're looking for? Browse other questions tagged sql-server temp-tables or ask your own question. how come a table variable is improving the performance of a query in this circumstance? Benefit or use-case for empty variable / parameter / temporary table / temporary procedure names? When exactly are multiple users unable to simultaneously run a stored procedure with a temp table?